Malus Admiration has perhaps the most exceptional blossom display of any white-flowered crabapple. 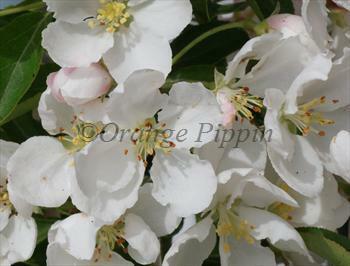 It flowers late in the season, and is a useful pollinator of late-flowering apple varieties. The tiny berry-like fruits stay on the tree into December and are a useful food for birds at that time of year. It is a naturally dwarf tree, and grows with a compact columnar upright habit - ignore the height information on our ordering form, in practice it is unlikely to reach more than 2.5m-3m in height. 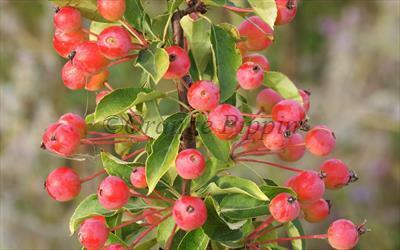 Please fill in the details below and we will let you know when Malus Admiration crab apple trees are back in stock. Malus Admiration is in flowering group 3. Malus Admiration is self-fertile and does not need a pollination partner, although fruiting may be improved if there is a compatible tree of a different variety nearby. Malus Admiration was developed specifically to be resistant to fireblight, and has good overall disease-resistance to most of the common diseases of apples and crab-apples. Malus Admiration was developed in the USA where it is known as Malus Adirondack.